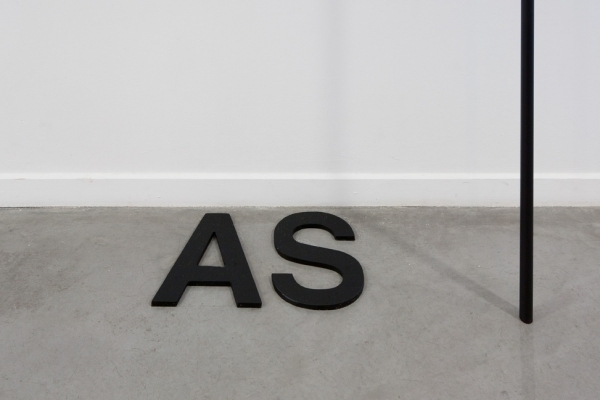 Peter Downsbrough has examined language and constructed space since the mid 1960s. 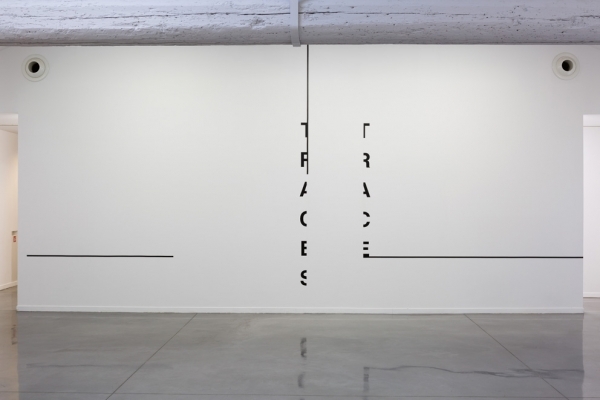 He leads a very personal and extremely thorough search which consists in structuring the space and creating discreet yet clearly visible volumes using a refined plastic vocabulary, made from simple geometric figures, lines, words and painted surfaces. 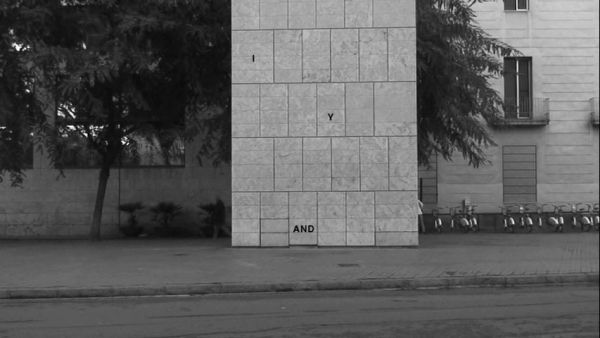 His numerous artistic practices - sculptures, photographs, mural works, books, films, publications, sound works, urban space interventions - are based on the concept of position, sequence, interval and frame, and question the viewpoint. The exhibition presented at the Languedoc-Roussillon Regional Museum of Contemporary Art in Sérignan, the largest ever presented in France, will highlight the full extent of his work. Peter Downsbrough intervenes in the museum forecourt, then from the entrance through the books- hop and along the corridor to guide us around the exhibition space. 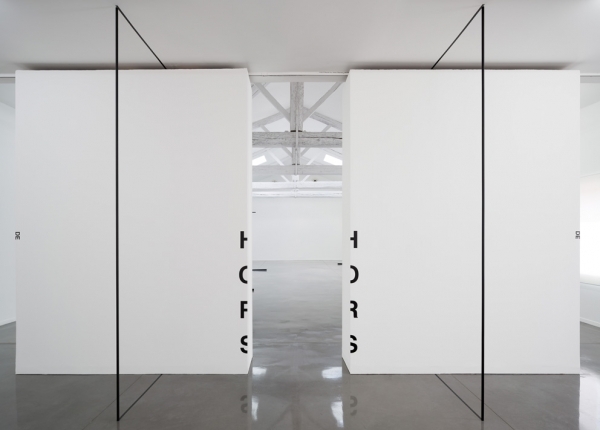 He installs metal pipes that fall from the ceiling to graze the floor, hangs letters, and traces lines of black adhesive tape to create an astonishing sensation of volume while allowing the gaze to penetrate. His process of optical cutting, refocusing, suggests a new understanding of the space. The scattered words, short speech (encore, là, et, vers, as, but, and...), encourage a search beyond the visual field. His interventions reveal open intervals which change according to the view point. A publication enriched with text by Raphaël Pirenne will be released for the exhibition. 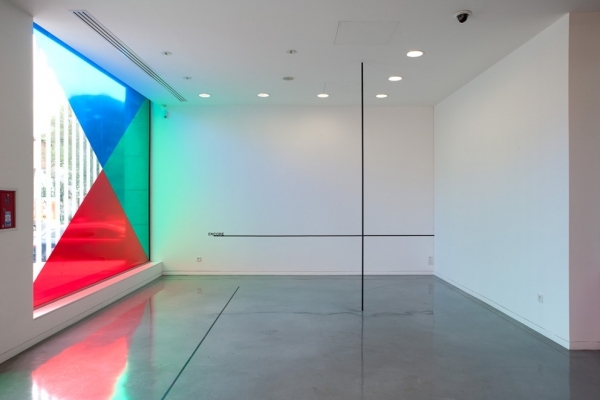 Peter Downsbrough, ENCORE, LA, LA, production in situ, 2013. Metal pipes, adhesive tape, adhesive letters (detail). 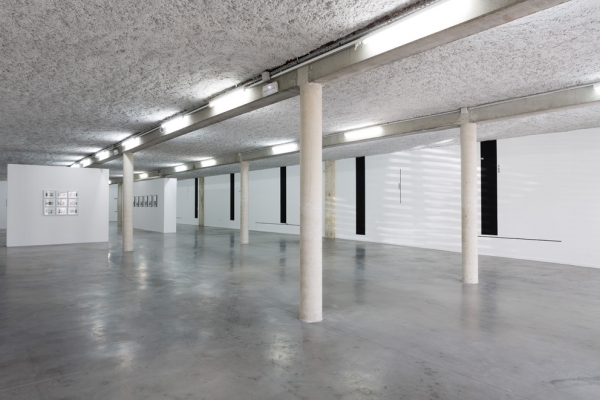 Courtesy of the artist & Galerie Martine Aboucaya, Paris. Production MRAC-LR, Sérignan. Photography J-P Planchon. Exhibition view. Courtesy of MRAC Languédoc-Roussillon.Photo: J-P Planchon. Exhibition view. Courtesy of MRAC Languédoc-Roussillon. Photo: J-P Planchon. 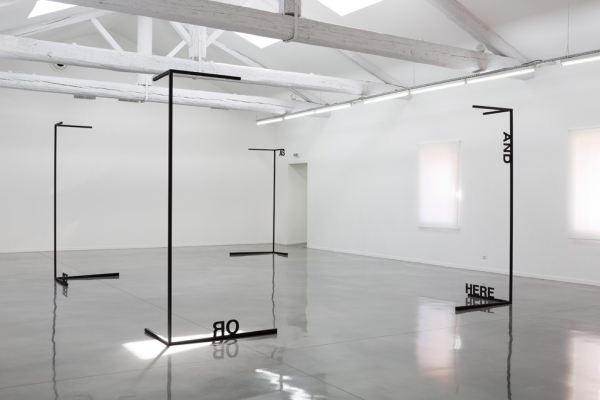 Peter Downsbrough, AND, AS, BUT, production in situ, 2013. Metal pipes, adhesive tape, steel letters (detail). 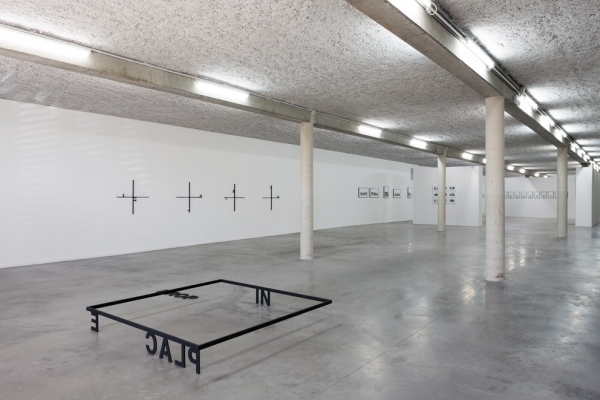 Courtesy of the artist and Galerie Martine Aboucaya, Paris. Production MRAC-LR, Sérignan. Photo: J-P Planchon. Peter Downsbrough, I, Y, AND, 2010. B/W, 6'30" produced by the La Virreina Image Centre,Institut de Cultura de Barcelona and Àngels Barcelona,Courtesy of Àngels Barcelona. © Peter Downsbrough and Artists Rights Society (ARS), New York.